Trin Nakara says it is working with foreign investors to launch a Bt40 billion investment project dubbed “Trin Nakara Golden Triangle” aiming to develop over 3,139 rai in a special economic zone in Chiang Saen district, Chiang Rai province, to transform it to “the City of Harmonious Living”. It will also work with US based-Trident Support to construct the world’s tallest free-standing flagpole at 189 metres. The flagpole will be recorded in the Guinness World Records, the firm said. Trin Nilprasert, CEO of Trin Innovation, said: “Chiang Saen has high potential in various aspects as the government has designated Chiang Rai province to be one of the special economic development zones. "Moreover, Chiang Rai has executed a development plan under the concept of Tourism Innovation Thailand 4.0, aiming to transform Chiang Rai into “the city of commerce, investment, agriculture and tourism, enriched with Lanna culture and enabling happy living”. We see unique opportunities as Chiang Saen has a strategic significance,” Trin said. “It is bordered by Myanmar and Laos in the region known as the golden triangle in the north-south economic corridor, where several development projects will be implemented, including infrastructure from southern China to Thailand, Myanmar and Laos. 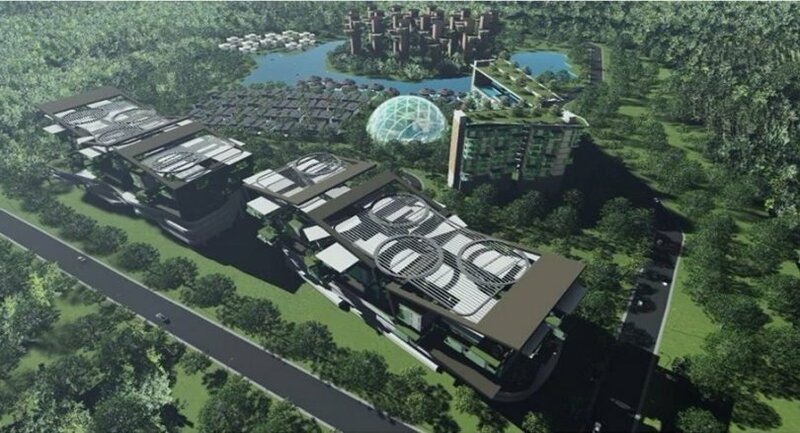 "As three districts of Chiang Rai have been designated to be special economic zones, the government will prepare infrastructure for international transport and logistics, and offer benefits in investment, finance and customs,” Trin said. “On the Mekong, Chiang Saen is well known for its natural beauty, rich traditions, cultural heritage and friendly people. Chiang Saen was the location of the Yonok kingdom, so it has historical sites and cultural heritage. “Trin Nakara Golden Triangle has interested investors from Malaysia, Singapore, Japan, Hong Kong, the United States and China. With more than Bt40 billion investment, it covers three sub-districts – Wiang-Nok, Pasak and Yonok." Trin said the project would include hotels, a health centre, condominiums, a mall, souvenir shops and an international convention centre. Interesting, but how long before a casino (or casinos) are included ("special economic development zone") to compete with Chinese "Las Vegas" on the opposite bank of the Mekong in Laos? Definitely being planned with the Chinese in mind. 20 years ago this area was very quiet and scenic. You could look across the Mekong towards pristine forests and small villages in Laos but these days the area is dominated by GAMBLING, mainly by the Thais and Chinese - great shame! Nowadays, you can park your car near Chiang Saen and cross to the Laos casinos by small boats - no proper immigration and/or visa controls whatsoever. I thought that the gurt big flagpole was already built/being built, or is this another one.